We Love Clean Rivers in partnership with the Clackamas County Arts Alliance, is accepted qualification from Artists or Artist Teams for an opportunity to create three (3) unique Public Art bike racks in conjunction with the We Love Clean Rivers RiPPLe Art Program. 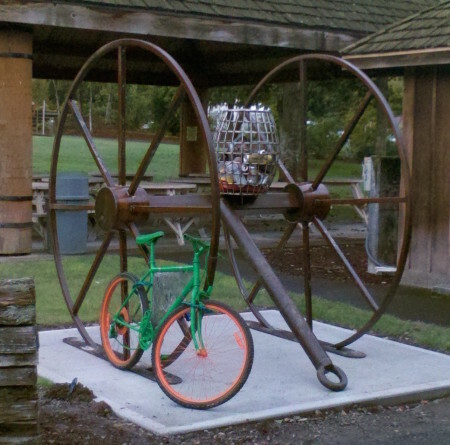 One bike rack was installed in each of the 3 participating cities including Milwaukie, Oregon City and West Linn . 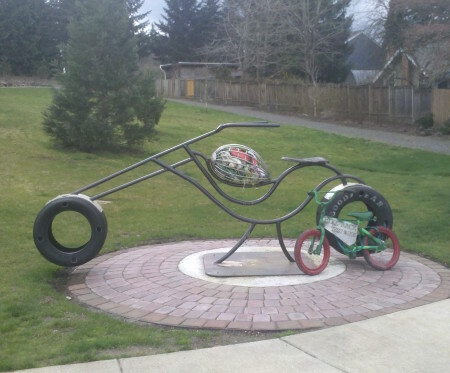 RiPPLe Racks was a multi-community project in Clackamas County, which aimed to encourage sustainable bike transportation and cyclists to linger longer, while also sprucing up public spaces with fun, attractive art that tells a great story of keeping our rivers healthy. The goal was that RiPPLE Racks were to be inspired by and incorporate items collected from prior Clackamas and Willamette Rivers clean ups. We Love Clean Rivers assisted in soliciting a portion of the remaining metal material needed for the artist to complete the bicycle racks from an Oregon-based scrap or virgin metal dealer. 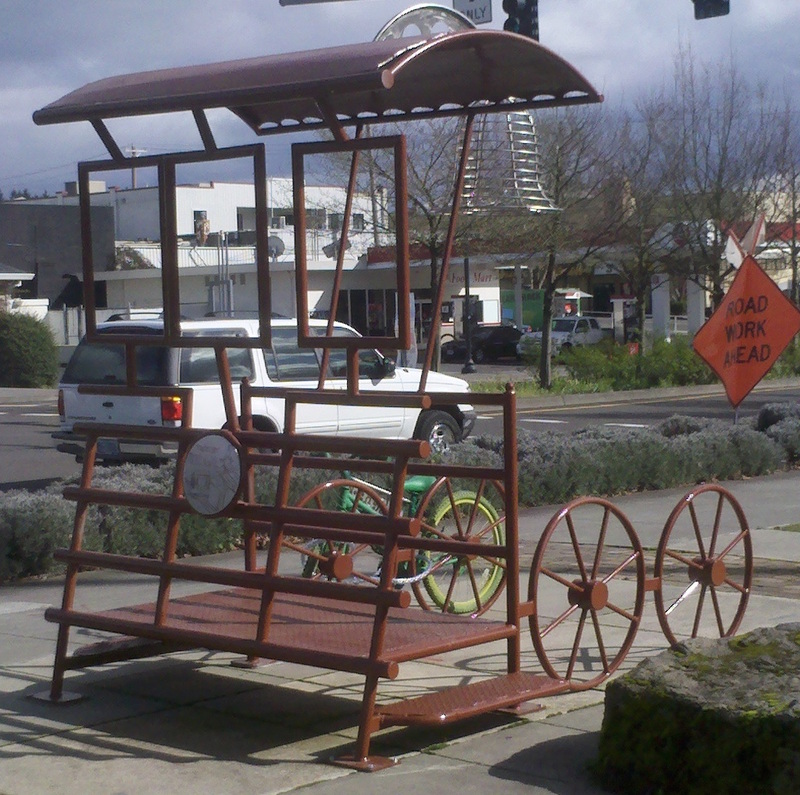 The racks were installed in Milwaukie, West Linn and Oregon City by September 2013. RiPPle Racks were made possible by the 2013 Clackamas County Tourism & Cultural Affairs Development Grant. The RiPPLe Art program began in 2008 when We Love Clean Rivers founded the RiPPLe Effect—to inspire people to make sustainable lifestyle choices through art. RiPPLe Effect originally consisted of one event, the RiPPle Art Auction, where a team of local artists participated by sorting through items collected out of the Clackamas River during the annual Down the River Clean Up event. The artists then had one month to turn their findings into art, which was displayed and auctioned of at an evening event. It was a huge success and has since become not only an annual fundraiser and educational celebration, but also an on-going awareness program aimed at promoting sustainability, stewardship, recreation, fun, and reuse through art! In April 2013, We Love Clean Rivers, with support from an Oregon City Metro Grant, commissioned a local artist to create the RiPPLe Legacy sculpture sited at the entrance of Clackamette Park in Oregon City. This project was inspired by the 2012 Down the River Cleanup and expands the RiPPLe Art Program to include its first Public Art installation.